...as if you need them. The 4 L's: Ladies love long locks... on your face. It has long been known to science that chicks dig sweet beards. In fact, as a man sporting a sweet beard, you are three million percent * more likely to impress the ladies than someone sporting a beardless boy face. Let's make one thing perfectly clear: wind is a killer*. It strips us of our very body heat, numbing to the core that which we may hold most precious, our faces. Phrases such as "the wind literally killed my children" and "bungalow brutally burgled by blistering breezes," aren't just hyperbole, or alliteration, or things the elderly say to get attention. They're the Church of Pogonotrophy's official interpretations* of life without the benefit of a sweet beard protecting one's face from earth's soul-crushing elements. Yet phrases such as "wind in your hair," or "sweet beard blowing in the wind" have noticeably more positive connotations. This is not a coincidence. Rarely in today's fast-paced, modern, electronic, space-age life do we have the opportunity to sit down and truly enjoy a meal. With a sweet beard and simple disregard for vigorous hygenic cleanup after eating, flavors can be savored hours after initial consumption. "Compensation" is such a dirty word. "Breathtaking", "amazing", "stunning", "thrilling", and "banana" are others. Sweet beards deliver where other products simply can't*. On time, under budget, above the limit, below the line, and around the fence, beards bring our troops home safely *. Man was not designed to be shorn. Shoving sharp shears over his face on a daily basis. Studies have indisputably proven that depression, enlarged prostate, acne, breast cancer, constipation, and gout can be directly linked* to the act of shaving one's face. 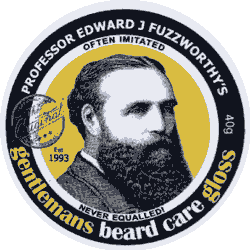 By renouncing the razor, not only will a sweet beard naturally flourish, but you will live a longer and happier life. Guaranteed *. So what are you waiting for? Create a pogonotrophist or evangelist account right now! * All "facts" are approximations and/or blatant fabrications, but seriously, grow a beard.